BOTTOM LINE: Homophobia gets a sympathetic look in this troubling and controversial drama. 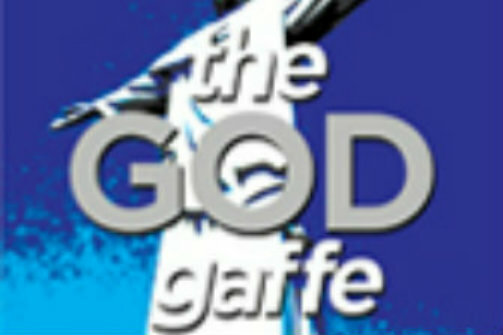 The God Gaffe offers something unique: a right wing, Christian conservative depicted as a sympathetic character. Writer/director John William Schiffbauer is not being ironic: a devout Catholic character who believes that homosexuality is a sin is at the center of his tale. What Schiffbauer is playing with here is somewhat brave, but ultimately very complicated. What troubles me is that I’m just not sure if he’s aware of that complexity. The play takes place behind the scenes of a morning news show and involves the show’s gay executive producer Jeremy Blocker (Vincent Torres), and Patricia McCallister (Hannah Beck), the aforementioned right-wing conservative anchor. While interviewing a 15 year-old kid who happens to be gay, Patricia asks a question that is evidently pretty inflammatory and insulting. I say evidently only because we are never explicitly told what the question is. But I take Jeremy at his word that it was pretty objectionable, as he is fully prepared to fire an anchor, who also happens to be his good friend, over the incident. Jeremy gives Patricia the choice between an on-air apology or immediate suspension. But Patricia is convinced that such an apology could ruin her popularity and career since her fan base is made up of the Christian right. Will she apologize or will Jeremy be forced to banish her? The situation is obviously very compelling. Schiffbauer’s dialogue is snappy, entertaining, and filled with satisfying banter. The actors do everything they can to deliver the complexities that Schiffbauer intends. But the script just lacks too many details to captivate. For starters, it would have been nice to hear what Patricia actually asked the kid. The audience waits with bated breath for the answer to this question. Unfortunately, it never comes. And just why does Jeremy care so much for a woman who obviously objects to his identity? For that matter, why would Patricia want to be Jeremy’s friend if she truly feels that he lives a sinful life? And why should we be sympathetic to Patricia’s dilemma? I waited for Jeremy to show Patricia the door and banish her from his life, and for the life of me, I couldn’t figure out why he would spend the ninety minutes of the play dragging his feet. I suspect that Schiffbauer knows the answer to this question, but it’s going to take another rewrite to clarify. Schiffbauer seems interested in humanizing the perspective of the Christian right. I commend him for his interest in doing that. All perspectives deserve a human face in the theatre. But how do you get the audience to care for an intolerant and bigoted character? Well, that’s a more difficult question. And I’m afraid I don’t have any words of advice for Mr. Schiffbauer. But I wish him a lot of luck.